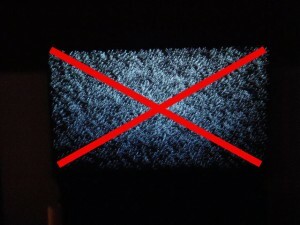 White dots on your Samsung HLT6156WX/XAA is a sign that the 4719-001997 DLP Chip needs replacing. 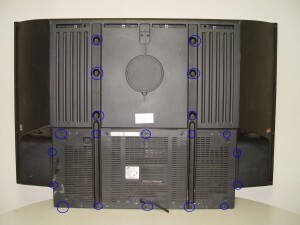 Replace your 4719-001997 DLP Chip for under $300 and get rid of those white dots. 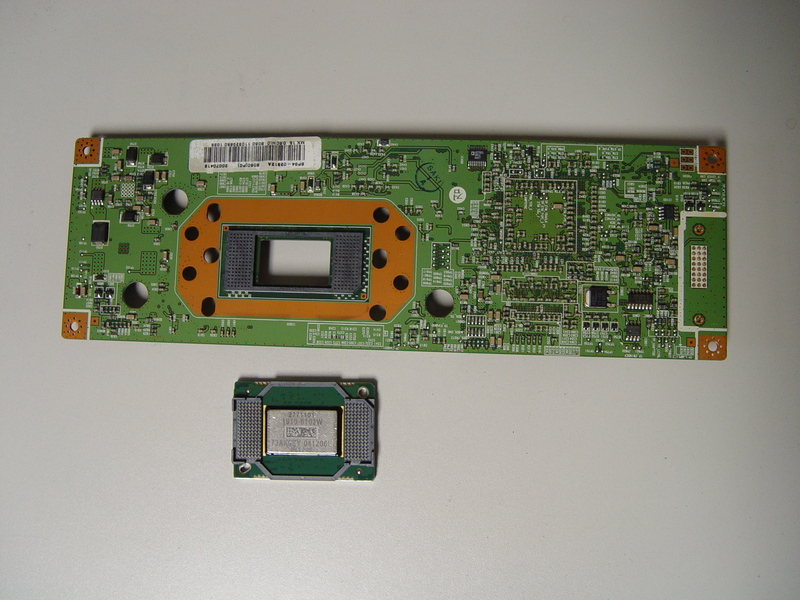 Find this New Mitsubishi/Toshiba 4719-001997 DLP Chip 1910-6143W on Amazon. Step 1: Put on the plastic gloves. Loosen all the screws found on the back panel. 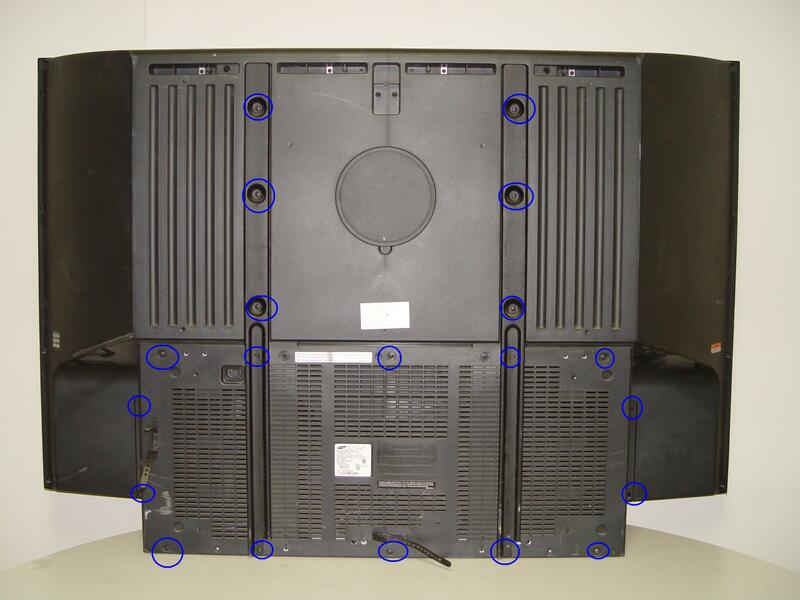 Put the screws to one side and remove the back panel. Step 2: Loosen the two screws holding the lamp bracket in place. 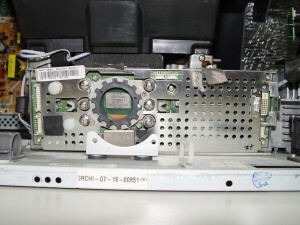 Step 3: Remove the 4 screws holding the lamp engine in place. Disconnect all the connectors. Important: don’t yank any cables. Step 4: Carefully remove light engine from the cabinet. 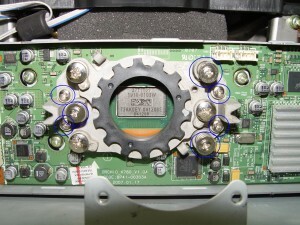 Step 5: Remove the 2 screws holding the color wheel protective cover in it place. 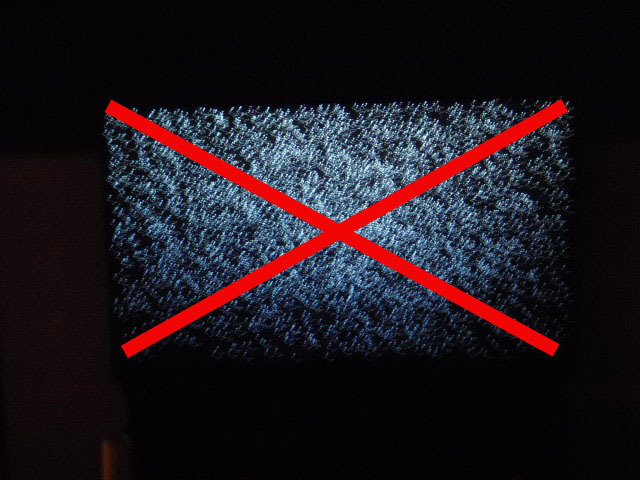 Avoid touching any of the optical components as this can affect the quality of your picture. 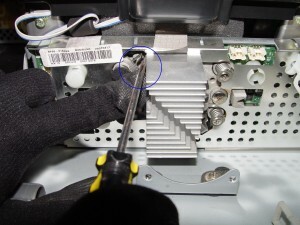 Step 6: Carefully disconnect the cables between the terminal board and lamp. 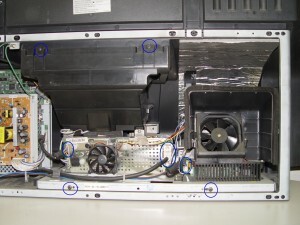 Step 7: Disconnect the clip connecting the cooling unit. 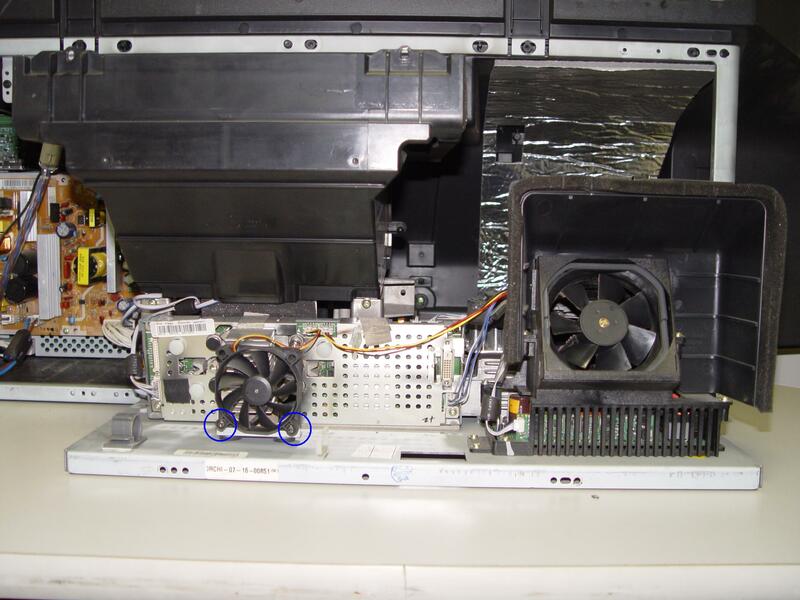 Step 8: Remove the cooling unit and terminal board. 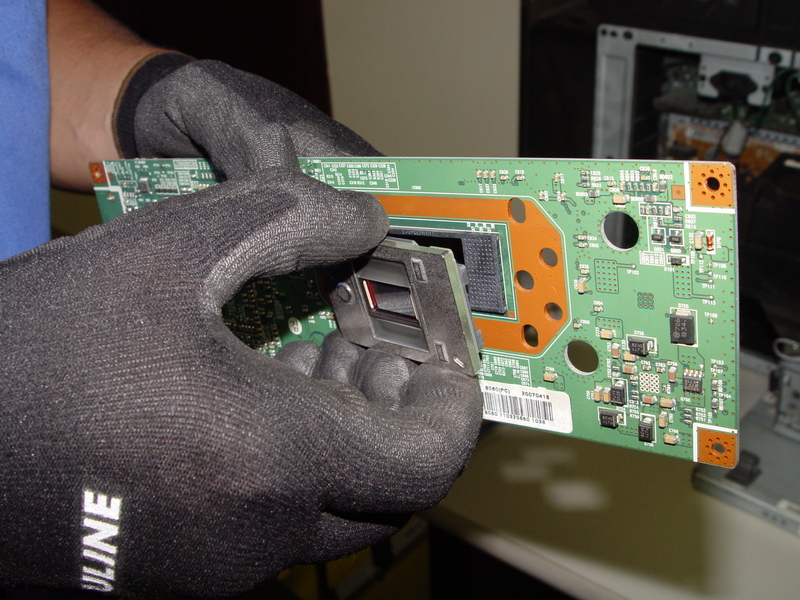 Step 9: Remove the terminal board. Step 10: Loosen the 7 screws holding the terminal cover in place. (Good time to dust this section). 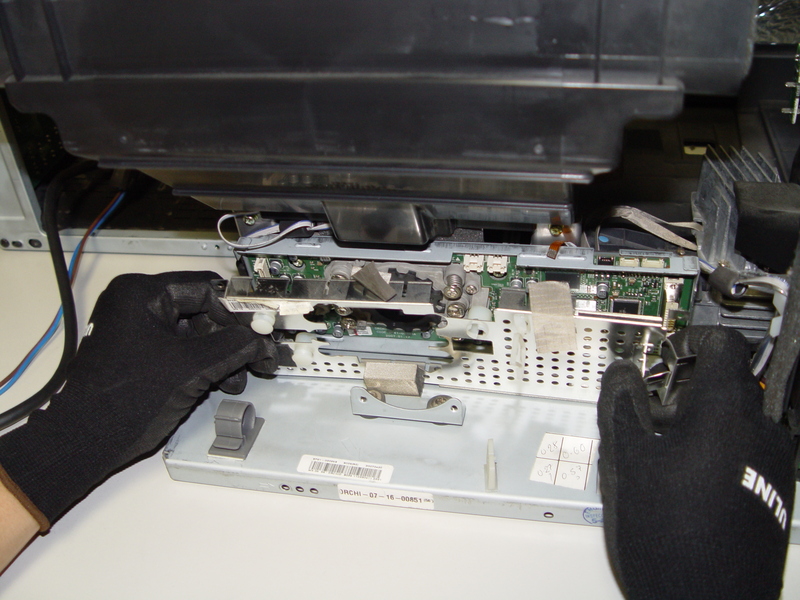 Step 11: Carefully pop the terminal out of its holder. 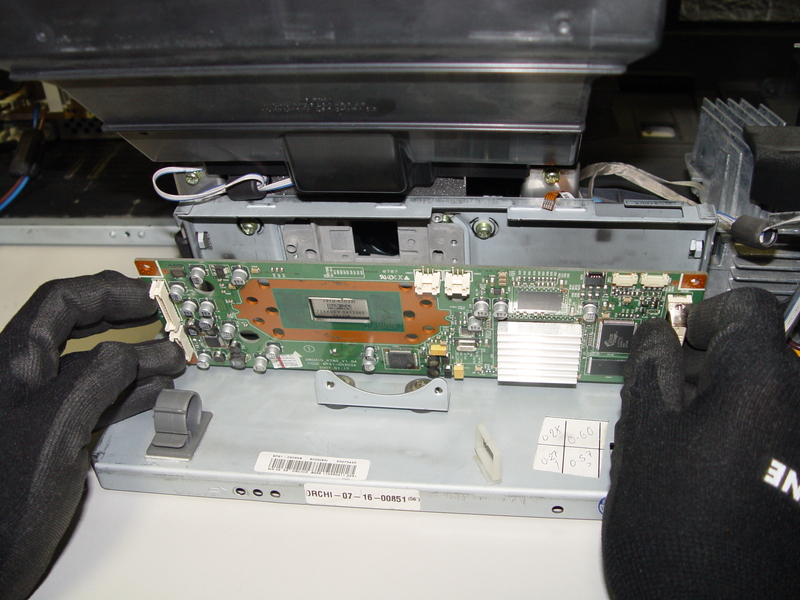 Step 12: Unlock the old DLP Chip from the terminal. You may need to use a flat edged screwdriver to pop it out. Step 13: Place the new DLP chip into place. 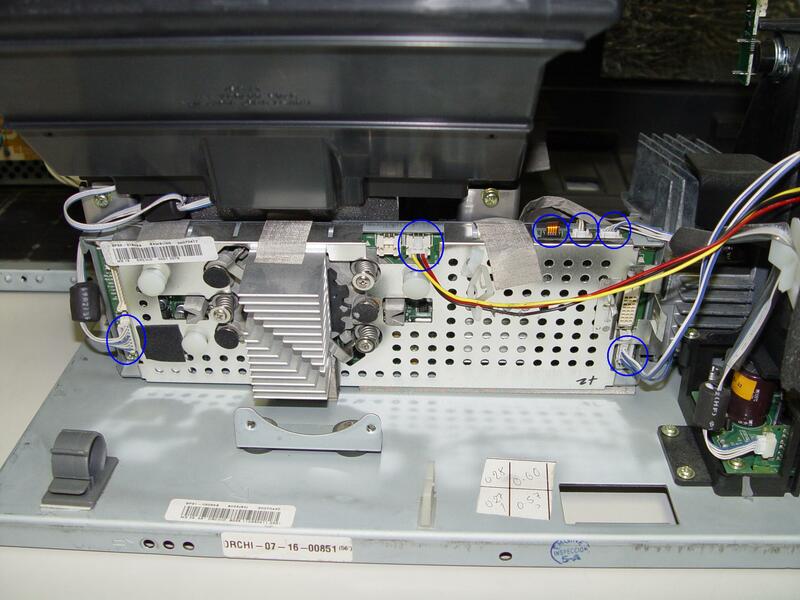 Handle the DMD DLP CHIP only by the edges because it is very sensitive to static electricity. Step 14: Put the terminal back into its holder. Step 15: Tighten the 7 screws holding the terminal in place. Step 16: Replace the terminal board’s cover. 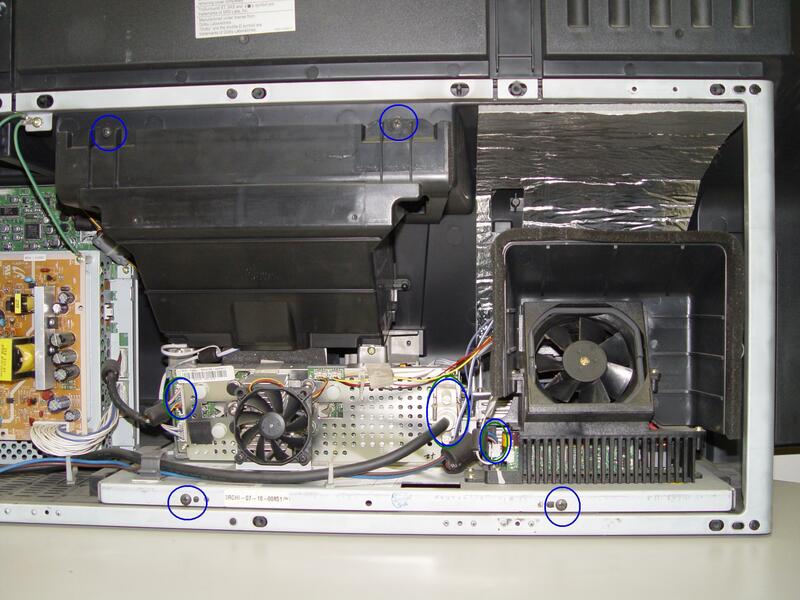 Step 17: Reconnect the clip holding the cooling unit. 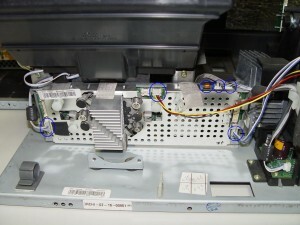 Step 18: Re-connect the cables between the terminal board and lamp. Step 19: Tighten the 2 screws holding the color wheel protective cover in it place. Avoid touching any of the optical components as this can affect the quality of your picture. Step 20: Carefully replace the light engine back into the cabinet. Step 21: Replace and tighten the 4 screws holding the lamp engine in place. Re-connect all the connectors. Step 22: Put the light engine back into the RPTV. Tighten both screws that keep the back bracket in place. 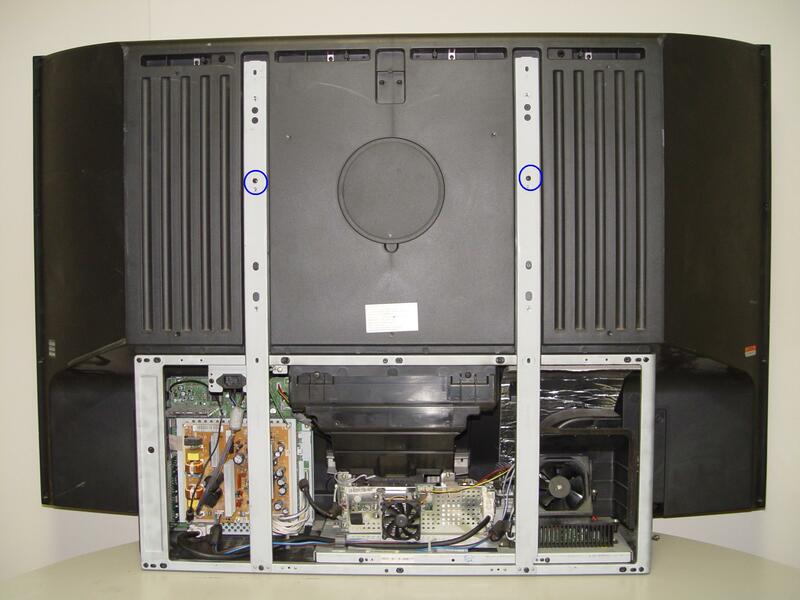 Step 23: Put the back panel back onto the TV. Tighten all the screws and make sure the door is securely closed. 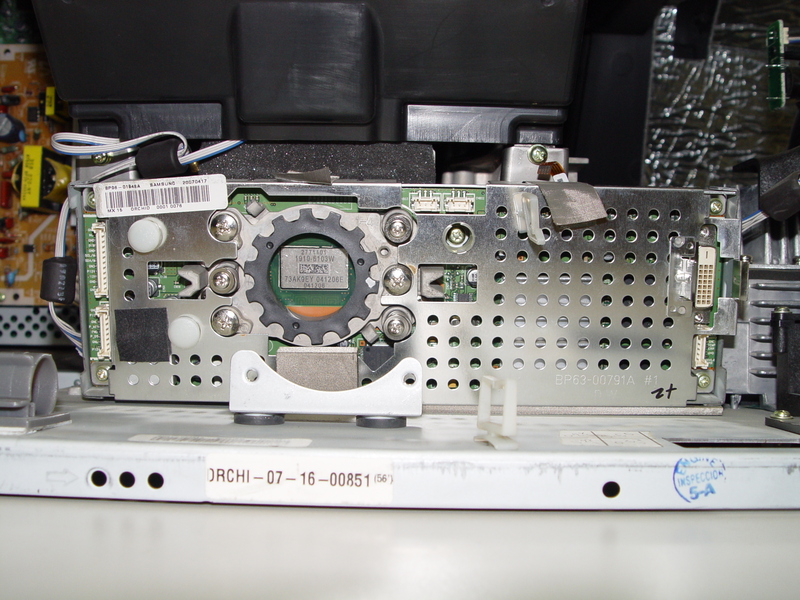 Enjoy the crisp, clear picture on your Samsung HLT6156WX/XAA RPTV. Shop on Amazon for this chip.